Have downloaded some 4K movies from popular online streaming sites or shot some 4K footage with your 4K device recorders and wish to stream the 4K movies or videos to your 4K TV via WD TV? The following article will show you how to get 4K video played on WD TV. Can WD TV play 4K video? From WD TV’s user manual page, we can see that although WD TV can playback various file formats, however, the maximum file resolution for WD TV is limited to 1980×1020. Therefore, before WD TV develops a UHD/4K media player, the best way to watch 4K video on WD TV is to compress 4K to 1080p. To reduce 4K to 1080p, you need a 4K Video Converter. Based on the feedback of dozens of users, we highly recommend you our award-winner 4K Video Compressor – Pavtube Video Converter to you. The program has enhanced media compatibility with virtually any 4K files with the container formats of AVI, WMV, MP4, MOV, MKV, TS, MXF, XAVC, XAVC S, etc and the compression codec of H.264, H.265, Prores, etc. You can efficiently compress 4K video to 1080p or 720p in various HD files with the formats of H.264 HD MP4, H.264 HD MOV, H.265 HD, MPEG-4 HD MP4, MPEG-2 HD, MPEG-TS HD, MKV HD, WMV HD, Divx HD, AVI HD, BDAV HD, etc. Here, to play the reduced HD video on WD TV, we highly recommend you to choose H.264 HD file formats. The program supports batch conversion mode, so that you can import multiple 4K video into the application for compression at one time. In addition, you can also tweak other profile settings including video codec, bit rate, frame rate and audio codec, bit rate, sample rate, channels to get best output video and audio quality that you desire. 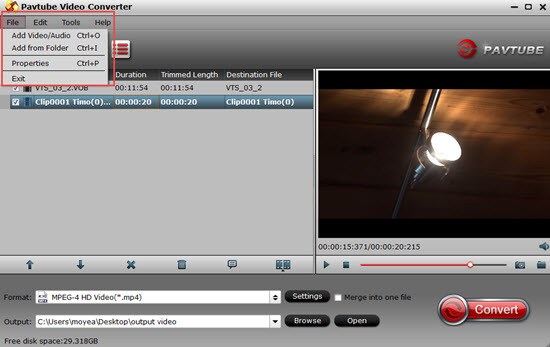 For Mac users, you can download the Mac version – Pavtube Video Converter for Mac to perform the conversion on macOS High Sierra, macOS Sierra, Mac OS X El Capitan, Mac OS X Yosemite, Mac OS X Mavericks. 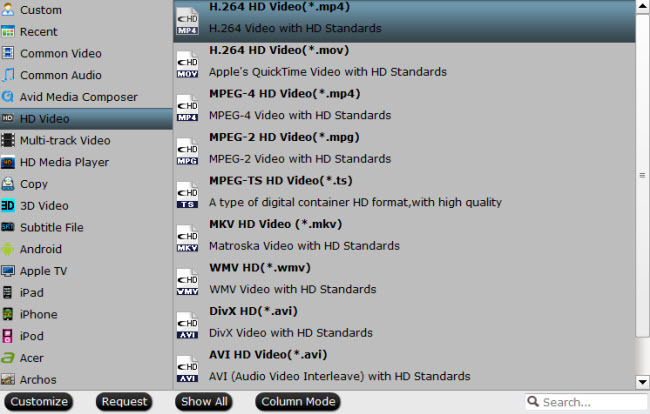 Step 2: Output WD TV supported HD file formats. From “Format” drop-down list, select WD TV playable HD file formats “HD Video > H.264 HD Video(*mp4)” as the output file format for playing on WD TV HD, WD TV Live and WD TV Mini. Click “Settings” to open “Profile Settings” window, adjust the output file resolution as “1980*1020″; or “1080*720″; from the “Size(pix)”; drop-down option. Step 4: Start the final format compression process. After the conversion, you can click the “Open output folder” icon to pop output the directory with the converted files. Then you can stream or play converted files on WD TV media player via either home network or external hard drives.